• PLOT SUMMARY: Go west, young lady! Kate Bishop heads to Los Angeles -- to get away from New York, life, and Clint Barton-but NOT trouble! But Madame Masque is hanging out at poolside with the rich and famous as well! Who is Kate Bishop? Find out alongside Kate Bishop herself as a wild new status quo comes to HAWKEYE. 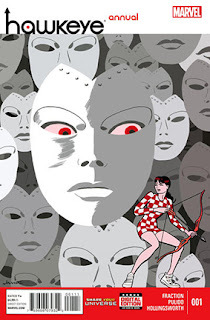 (W) Matt Fraction (A/CA) Javier Pulido.